Between 11 and 15 November 2018, more than 25 retailers, architects and trend scouts found inspiration in the desert metropolises of Dubai and Abu Dhabi within the framework of the umdasch Shop Academy study expedition. 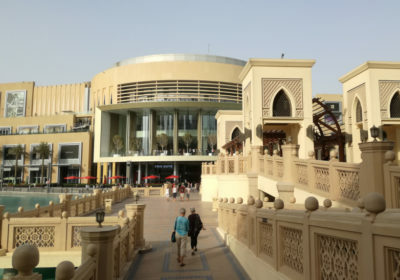 Their sight-seeing programme took in numerous shopping malls and outdoor retail concepts, together with the sources of shop dramaturgy such as the traditional “Gold Souk”. The content of the tour was put together by the two retail trend scouts Christian Mikunda and Denise Mikunda-Schulz. The shopping miles, promenades and experience concepts of the United Arab Emirates impress with casual street-art flair and perfectly staged theme settings. In the evenings spectators are drawn to many shopping malls by the spectacular water gardens combined with media shows at the highest level. Shopping in the Emirates becomes an experience, especially in the Dubai Mall: across 223,000 m² it offers more than 1,200 shops, some 40 gastronomic outlets, a large ice rink, a gigantic virtual-reality park and an Aqua Zoo with a direct view from the Mall onto the underwater world. By means of “Art Priming” – the emotional charging through art – the expanse of the shopping temple is broken up emotionally. 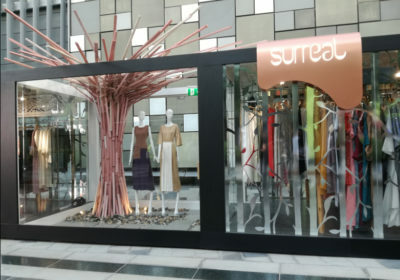 Especially in Fashion Avenue, the new luxury Fashion District of Dubai Mall, this hypno-aesthetic artifice comes into play. An artfully staged swarm of butterflies suspended from the ceiling and temple gates in the form of luxuriant arches of roses serve as selfie spots and provide personal hashtag moments. In order to get to know the origins of the Arab retail landscape better, the group also visited the oriental souks (markets). In spite of the high product pressure the traditional spice and gold souks in particular play skilfully with visual gluttony. Shopping in the Arabian style here means haggling over every price. On the way to Abu Dhabi the umdasch Shop Academy expedition caravan put in a short stopover at LAST EXIT – a street-food truck park. Shopfitting is often compared with stage-building. 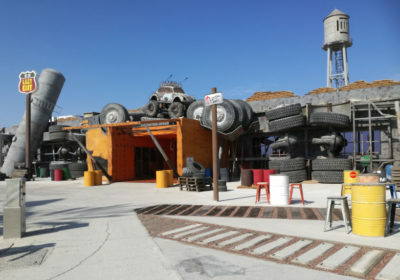 The stages for these drive-in restaurants are very different – from a stylistically authentic tribute to the film “Mad Max” via “American Diner” – the LAST EXIT food trucks act before perfectly staged theme backdrops. It is fascinating to see how American influences are increasingly invading the Arab desert states. Visits to the Great Mosque in Abu Dhabi and the new Louvre Museum were also essential elements of the programme. The participants were enormously impressed by the architectural and landmark effect of both structures. In contrast to Dubai, over the last decade Abu Dhabi has developed into a stylish Emirate of Culture which allows the old traditions of Arabia to flourish. In the world-famous Emirates Palace Hotel, where coffee and cakes are served on gold trays, the visitors could sense the longing for a royal lifestyle. Back in Dubai: a concept to increase the quality of stay in the various districts of the city has proved successful in the case of the Boxpark Dubai. The Container Mall lies opposite a residential district for locals and attracts visitors for interaction within the neighbourhood with a palm-fringed boulevard, a boutique cinema, diverse concept stores and restaurants. At a height of 828 metres, Burj Khalifa in the heart of downtown Dubai is incontestably the world’s tallest building and the landmark of the desert metropolis. The observation platform on the 124th and 125th floors provides a view of other landmarks and prominent features of Dubai, like for example the Burj Al Arab and the new golden Dubai Frame. “We always look out for axes, hubs and districts in order to be able to orientate ourselves better,” commented Mikunda with regard to the cognitive map and spatial opening of sales areas and public places. 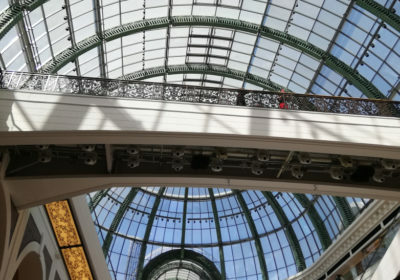 To this day, one of the first shopping temples in Dubai, the Mall of the Emirates, with the world-famous Ski Dome in the desert, remains one of the most-frequented malls in the Emirates. It shows that a well-made core attraction, like this indoor ski hall, guarantees a constant flow of visitors. City Walk is the name of the shopping mile in Dubai with the best visual presentation. Every corner is meticulously styled from start to finish. The retail and entertainment concept scores with a blend of cool street art and urban park atmosphere. 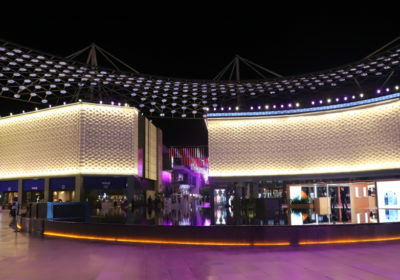 Apart from numerous high-profile retail concepts, a special highlight is the media show in the evenings, with a water garden in the atrium of the City Walk. Incidentally: during the hot summer months an outdoor air-conditioning system ensures pleasant temperatures during your shopping trip. All in all, it will be interesting to see which retail and experience concepts will have grown on the desert sands by the Expo 2020. La Mer on the Old Jumeirah Public Beach is the latest seaside hotspot in Dubai. During the daytime it invites visitors to a day of bathing on the beach, and in the evening to stroll and dine beside the Arabian Gulf. La Mer provides a modern, cosmopolitan street-art atmosphere which makes it a perfect destination for families at weekends.